Enchanting San Gimignano was the inspiration for none other than Shakespeare’s Romeo and Juliet. 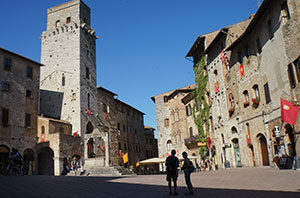 The towers of San Gimignano were built in medieval times for the purpose of defence, between feuding families a la the Montagues and the Capulets. Towers were typically built higher and higher to reflect the status of the family, leading to quite the visual spectacle today. It was these towers which gave Shakespeare the idea for the iconic “Romeo, Romeo wherefore art thou Romeo …” scene in which Juliet calls out to her star-crossed lover from the balcony of the tower. Well, if it’s good enough for Shakespeare .. San Gimignano is one of the most spectacular stops along the Via Francigena in Tuscany. With a landscape as picturesque as that of Val D’Orcia is it any wonder that its spectacular vistas were the inspiration of many a Renaissance painting? Characterised by acres of rolling green fields and verdant countryside. Often depicted in art with people living in harmony with the land and with nature.The peace and tranquility of this place makes it the perfect place to get away from it all. 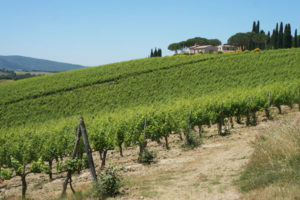 You will be walking across the Val D’Orcia on the Via Francigena from Siena. The atmospheric capital of Tuscany and birthplace of the Renaissance is often considered one of the most beautiful places in the world. Simply brimming with artistic and architectural heritage, it gained UNESCO World Heritage Status in 1982. Meander through its cobbled streets, lounge in its beautiful squares and enjoy an aperitivo in one of its many quaint little cafes. A little climb up to the Piazzale Michelangelo will gain views of Florence in all its splendour. Florence is the starting point of the St Francis Way trail. Romance is not just for the Mediterranean you know! One look at Chateau de Chillon, an island castle on the Swiss side of Lake Geneva, is enough to make us go weak at the knees. Perched at the edge of the serene lakes, the Alps as its dramatic back drop, this idyllic location is the perfect spot for a fairytale romance. 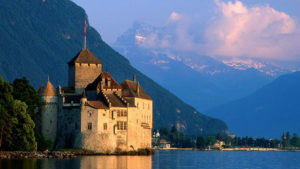 The castle can be visited from Montreaux which is on the Via Francigena from Lausanne. If a weekend of luxury wine induced giddiness is what you’re after, then look no further than Reims, the unofficial capital of the Champagne wine-growing region, on section 4 of the. Undisputedly, Reims is home to the best sparkling wine in the world. While the rich champagne grapes, favourable weather conditions and fertile landscape certainly play a sizeable part, to be a good winegrower, one has to have passion and patience … one might say the same about a good relationship! Sit back and enjoy a glass of bubbly while marvelling at the pristine countryside in a country buzzing with passion. Does it really get any more romantic than that? Can you think of any other romantic Via Francigena spots? For more information about cycling or walking the Via Francigena.